Hundreds of people were stranded on Wednesday in villages dotting Taiwan’s mountainous regions after Typhoon Morakot unleashed its fury over the weekend and caused the worst flooding in a half-century. Morakot dumped 83 inches (2.1 meters) of rain on parts of the island, unleashing the worst flooding there in half a century, according to the U.S. National Oceanic and Atmospheric Administration. Buildings collapsed in the floodwater, and mudslides buried everything in their paths. After hitting Taiwan on Saturday, the storm roared on to mainland China, killing at least six people and displacing 1.4 million, authorities said. Yet the death toll was much higher in Taiwan, where Morakot was blamed for at least 66 deaths. Figures from the Central Emergency Operation Center said the storm had injured 35 and at least 61 were missing, not including the hundreds trapped in debris. In northern Taiwan, mud slithered down a mountainside, sweeping up trees and rocks and carrying them into valleys below. In the south, a wall of mud inundated and completely cut off the village of Siaolin, burying houses. Watch what rescuers face in Taiwan » Officials said as many as 100 people might have been buried alive in Siaolin; residents feared the number was higher. Continuing rain had hampered rescue efforts, but the weather showed signs of letting up Wednesday, allowing better access to those in need of help. Kaohsiung County was particularly hard-hit. Taiwan’s Interior Ministry said Wednesday that 200 people were trapped in that county’s village of Namahsia and 38 were rescued by helicopter. Among the rescued, 18 were injured. In the village of Maolin, where 200 to 300 people were feared trapped, rescue workers were forced to suspend operations because of bad weather. Earlier, Taiwan’s semi-official Central News Agency reported as many as 700 people stranded. The ministry also reported Wednesday that 1,500 people were in urgent need of aid in Liugui. It said the air force had rescued 14 people from that village, including one who was injured. Authorities had found shelter for 8,900 of 10,576 people who were left homeless by the storm, said Wang Ke Jang, spokesman for the National Disaster Prevention and Protection Commission. But disaster struck even as efforts continued to help victims. A rescue helicopter crashed in the mountains in southern Taiwan’s Pingtung County on Tuesday, tumbled into a river and was washed away. A government spokesman confirmed Wednesday that all three crew members aboard were dead. Morakot felled bridges and turned roads into standing swamps, making them inaccessible to search-and-rescue teams. The United States is “very concerned” about the situation, but had not received a request for aid from the Taiwanese government, Assistant Secretary of State P.J. Crowley told reporters Tuesday. “We are a formidable asset to the region. 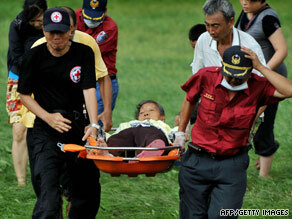 … As you have seen going back to the (2004) tsunami, we respond in a timely way to these tragedies,” he said. Helicopters were dropping food, medicine and water to help keep people alive, as they awaited rescue. Wang said reservoirs were overflowing, and people were piling sandbags wherever they could. iReport.com: Volunteers mobilize to help typhoon victims Prices of meat and vegetables increased about 20 percent in response to the limited supply, and officials said the government was releasing stockpiled food to force down prices. A report from the emergency operation center described dozens of deaths and missing-persons reports. Among the missing were three groups of people who had been fishing along the Tsengwen River. A rush of water “flushed away” a factory in Taitung County, and a worker was missing, authorities said. “The most pressing needs now are providing shelter, food and clean water for those who have had to evacuate their homes,” said Hank Du, executive director for the humanitarian group World Vision Taiwan. “We also want to make sure the children are secure and have a safe place where they are cared for.” The group had started to distribute food, cleaning supplies, raincoats, flashlights and other items to those displaced. Taiwan’s postal service announced Wednesday that all aid donations sent to Red Cross branches and the governments of Pintung and Taitung counties would be delivered free until August 20. The Taiwan Power Company reported that power had been restored by Tuesday night to most of the 2 million households without electricity, according to Taiwan’s Central News Agency. The storm caused $89 million in damage to the country’s aquaculture industry, its worst loss in 18 years, the news agency said, citing a report from the Taiwan Council of Agriculture. The storm made landfall Sunday in China on the coast of Fujian province about 4:20 p.m. Sunday, according to the state-run Xinhua news agency. Morakot’s winds were clocked there at 73 mph (118 kph) in its eye, according to the province’s meteorological bureau.